Shy, Tired or Rude? How do we encourage that child? Grasping my skirt like a lifeline, our young daughter refused to let go. I could feel her fingers clench tighter as she burrowed deeper into my skirt. No eye contact, no hello, not even a quick little peek around my leg. “I’m so sorry; she’s just shy and tired. She missed her nap today. There it was. Out of my mouth before I knew what was happening. I had once again intervened and excused our daughter’s poor choice. Let’s set the scenario up correctly. Everything communicated spoke fact. Our daughter was shy and tired, and sometimes, that’s enough to just let it go, but I began seeing myself as a parent who continually labeled their child’s personality, and she was using that. When a parent continually labels their child, they feel vindicated to choose certain behaviors because that’s “who they are”. They now have an excuse to always retreat, rather than choose to do the hard thing which is learn to greet graciously. It’s critical not to make the child feel self conscious over a personality trait, but embrace just how God has made her perfectly unique, yet desire to work through the weaknesses. Our daughter’s introverted nature holds gifts that I can’t even imagine. She shyness is not a weakness. Her compassionate heart and listening ear result from her more introspective personality, and I love how the Lord perfectly knit such a precious personality together, but I quickly realized that while her shy tendency would always bend towards retreating, rather than an excitement to meet new people, that personality trait should never excuse rudeness, and sometimes, she was being rude. Even as a child, no one is ever too shy that they can’t give 30 seconds 5 seconds of eye contact, a smile and a warm greeting. As moms, we have the power to help our children through that discomfort, train them, and dare I say ‘demand’ it? On a practical level, dealing with a shy child actually means spending time role playing at home, as well as letting them know that when they make a poor choice in public, you will help guide them through making the wise choice. Set them up for success and this means beginning early. At home, walk them through the new people they will meet. If you already notice this trait in your tiny ones, begin early, even before they are talking in complete sentences. When in public, pick them up, encourage them to give a little smile, and look the new person in the eyes. We are not asking for an award winning speech, just begin with and expect warm eye contact. It may take time and training. There will be days when they just can’t seem to get out from behind that skirt, and that is natural, but when you leave, make sure you talk them through what just occurred. Give them an understanding of how they could have handled it better. Keep encouraging them. Remind them to show Jesus love to everyone they meet, even if it’s just through a smile and a wave. As they get older, we don’t allow for any excuses. 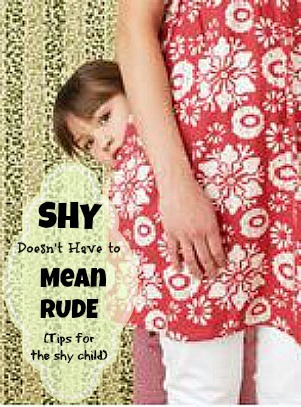 They’ve reached an age where they are allowing their shy personality to serve as an excuse to be rude. By age 8, our sons’ introductions included a firm hand shake, direct eye contact, and a smile. “Good evening, Mr. Smith. It’s so nice to meet you,” followed up by an understanding of simple back and forth conversation. Now as teenage men, they can hold amazing conversations with any adult they meet, in nearly any situation, but it came with much work and effort on our part to push situations that gave them that opportunity to grow. I share these situations using the “Shy Child” personality, but honestly, we need to stop labeling our kids in any negative way that excuses their behavior. The same scenario can be said for children who are extraverts and constantly monopolize conversation without even realizing it. We talk through that as well and encourage self control and an “others first” mentality. Again, they may be tired and missed a nap, but work on calling their behavior what it is, “sin.” Oh yikes, stepping on toes. I don’t mean you call them a little sinner in public, 😉 but we need to stop excusing their choices and train them in wise choices. Even with my teenagers, I don’t make excuses. I call it what it is. Selfishness, pride, anger, whatever they are struggling with and that gives me a true starting point on how to help pray for them and train them in righteousness. I do the same with myself. I can make so many excuses for my own behavior when it comes do to sin. I tell myself I am too busy, too overwhelmed etc, when it’s truly sometimes about my own choices. It takes a lot of time, energy and consistency in encouraging your kids to do the hard things, but one day, it will result in tears of joy as that shy child who wouldn’t come out from behind your skirt stands on stage at age nine and recites a few Christmas story verses in front of thousands of people. People might have thought my tears came from a proud momma and they would be right, but not because she was on a stage in front of people. No, this is a child who hates being the center of attention, a child content with remaining quiet, a child that doesn’t need the accolades from man in the public arena, this was just a daughter who rose to do the hard thing, the terrifying thing, one Christmas Eve when her family was asked to read the Christmas story. She said “Yes” when she didn’t want to, and it’s for her bravery and boldness that I was proud. Whether our child is 2 or 12, we can stop excusing our child’s bad behavior and begin to train those poor character choices right out of them. Raise the bar. You aren’t asking for too much. It’s not easy and it’s exhausting. Some days you’ll wonder if something so little matters, but trust me, it’s does and it’s worth it. 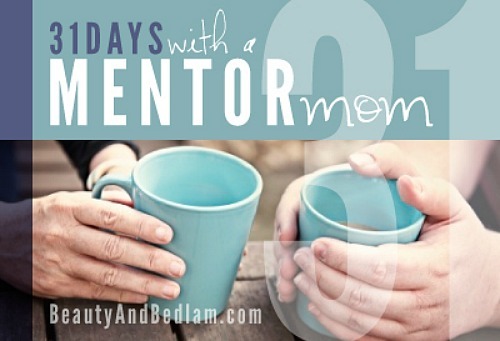 Are you following along with my 31 Days of a Mentor Mom series? I’d love to have you join me. You can also follow Balancing Beauty and Bedlam on Facebook, Pinterest and Instagram (jenschmidt_beautyandbedlam). *Please note that I understand this will not work as an easy 1, 2, 3 answer for children dealing with certain social anxiety issues or diagnosis, and that’s why I am thankful for counselors who can help children take those next steps. Thank you for this! We have a shy daughter, who just turned 6, and she does this, time, and time again. My husband’s “solution” has been to pick her up, and let her hid into him. He is now understanding why I was expecting, what he considered to be, so much from her. Great post! So glad your husband is now on the same page, Sue. That will make a huge difference. It’s so easy to just let them hid into us, isn’t it? Easier, but not better for the child in the long run. @Rochelle Phillips, You are so welcome. I remember that frustration as well and just realized that I had to be the one to help her through it or it would be an issue for the rest of her life. Our 4 year old is like this. I remember one day about 2 years ago, I had said she was shy. Then she started repeating “I’m just going to be shy today”. I just cringed because I knew what had been started. We’re working slowly to break her of this, but I feel like I’m going in circles and often times get so mad. What are some steps to take to help her get over this? Or something like that. If she has been wired as an introvert, addressing groups of people will most likely always be something outside her normal bent, but I think what you said, “working slowly to break her of this” is a great place to start. Thank you so much for this post! My daughter, 12, is so serious, quiet and reserved. (Not at home though.) You have pinpointed my feelings exactly. Though her personality will always tend towards introvert, that does not excuse rude. I was shy and quiet as a child, but not to this degree. I keep thinking, one day she will outgrow it like I did. Confidence and maturity will one day reign. At church I have to tell her not to be my shadow, go talk with her friends. Even at school, friends have told her, it is ok to wave to them in the hall! This is an exhausting struggle. You have given key words that will help me to encourage. I am going to tell her exactly what I expect from her in social situations. I will not give up! My daughter was this way until kindergarten. I required she wave instead of saying hello. It took a lot of work, but it did work. She’s much more open now. I agree and believe that I created some of her “shyness” since now it’s not her personality at all. She’s the first born and we learned the hard way. I tried not to make a big deal of it but I did remind her she must at least wave to acknowledge someone spoke to her. Before meeting new people I’d remind her and if she forgot I told her in the situation. My son was more stubborn but the same consistent expectations worked on him as well. He’s open to saying “hi” but not much else and that is fine with me. I think it also helps to model the behavior we’d like our kids to achieve. So true. Such great points and you are right, a little smile and a wave is a perfect jumping off point. Thank you for this! My two and a half year old is painfully shy! I on the other hand a not! It has been hard for me to have to leave situations because she can’t handle them. I love the idea of role playing at home on the proper way to meet and greet people! We do lots of role playing and talking about new places so that she is prepared and it has helped so much! We will add this to our parenting! I also love the reminder to stop labeling! She is shy and I just don’t know what else to say bedsides that! I really like the description of “slow to warm” or explain it takes her awhile to adjust to new people/situations. Once “warmed up” does she settle in okay? You may model waving “hi” instead of speaking. It really worked well for us. Thanks so much for this encouragement. We need to take the time and effort to work on this with our kids. i was like this as a child. i wouldn’t greet people. not even family. i’m still like this. i don’t think to say ‘excuse me’ at the store… which is considered rude to the public… but i don’t speak much. sometimes i give a partial smile so they don’t think things. oh well…. I am like this as well. I wished my parents had read this when I was a child. Hopefully, I will remember this when I have my own children who if they are anything like their mother, will be shy. I am working on my problems the best I know how but I still have my weak moments and appear rude to people and it hurts to have that assumed about you. I hate that that is what they think of me and I hate that I came off that way. @Nicole, I was always thought of as “stuck up” when I was in high school because I was so shy. It is rough, I understand. I think it’s great that you’re aware and working on it. That alone will benefit your children to see that Mom has to work on things too. (hugs) We all have something that we are working on. Shyness is SO real and just the fact that you are aware of it is wonderful! I am sure people understand. Hello! Thank you so much for this post. This is what I have been trying to explain to certain family members. They think we are being harsh and outright mean. My oldest daughter is 3. My husband and I were thankfully on the same page about her training. It has taken about 2 and half years to get her comfortable enough to look at an adult and say hello. She will even talk about her dress, or new shoes, or whatever is on her mind at the moment. We are still struggling with her fears of doctors or being scared in general. I think she is using the “I’m scared” as a crutch. It’s my hope she will just mature out of this phase. Does anyone have any positive experience that could help us help our little girl? Absolutely!! Isn’t it so amazing that each of our children can be so unique in their own way? Oh goodness I needed this! My five year old is very outgoing, while my three year old has major social anxiety. I have used “shy” and “scared” and “nervous” around her, so she does use those terms now…and my oldest often tells people her sister is shy and nervous and scared and what not. But I have been trying so hard to get her to at least acknowledge others around her when they say hi. It’s hard for my three year old because she has the most gorgeous red hair, and EVERYONE wants to comment on it. So she gets extra attention and hates ANY attention at all. Plus, her older sister talks for her so much that she finds she can get away with being rude. But I am definitely going to start trying to teach her more….and definitely do practice at home! Thanks so much for this! Thank you for your thoughtful post. My almost 5 year old son takes a long time to warm up to people and because of this, doesn’t make eye contact and uses the quietest voice when speaking. Although I am introverted I find myself frustrated by his behavior when all I would like from him is a polite hello/goodbye to the person trying to converse with him. I love the role play idea. Do you just do simple situation and practice or do you have any tips on the best way to practice these scenarios? Great post, Jen! Our 6 year-old son is painfully shy, especially when meeting new people. My husband and I were both very shy as children so we are very sensitive to it, but we definitely need to be more proactive about encouraging him to greet people he meets. Thanks Erin. It’s hard to believe you were shy, but I understand because that’s how my daughter was as well and now you’d never know it was a struggle. Hello. Good post. I have a slightly different opinion however. I was like this as a child and I suppose I was labeled shy. (Not that you would know it now, I have to convince people I am not an extrovert.) I remember very clearly not knowing for sure if the person in front of me was “okay” enough to talk to and I needed a long time to observe them before I was ready to say anything conversationally. I was expected to be polite, but I am so thankful for an introverted father who fought for me not having to carry on extended conversations with people I was not comfortable with. Probably I would have been labeled with social anxiety when really, I simply wished to watch you and was fascinated, I was not interested in conversing. I, too, carried on mature conversations with adults in my teen years, worked with kids, had jobs outside the home, etc. So this extended safety period was not the ruin of me. But I might caution too much pushing knowing just how valuable that was for me. Thanks Vanessa for that thoughtful insight. Sounds like you had a dad who knew you well. Specifically for our shy child, it was encouraging her not in extended conversing, but just to greet warmly, even with a hello, but that would have been a totally different situation if she had been alone by herself and wasn’t assured of her safety. Thanks for chiming in. We can learn something from everyones experiences and I appreciate yours. Thanks so much for sharing these thoughts. My middle son is like this, but he has reached the age of 8 and we still struggle constantly with him in situations like the ones you describe. He is a bit shy (though I think more stubborn than shy sometimes). It’s hard to know when to let him be who he is and when to fight the fight to teach him basic public behavior. I really think I need to be more firm about him shaking hands in church (for instance). Thanks for offering a point of view that is different from the typical “kids will be kids” speeches we so often hear.